And so we reach the end of our Five Nights at Freddy's reviews by Funko, covering the only animatronic from this series that doesn't originate in the first game - Springtrap, the creepy dilapidated antagonist from Five Nights at Freddy's 3. Springtrap is an early model of a Bonnie suit, a heavily damaged rabbit animatronic of an olive drab color. A great portion of his right ear is missing with wires sticking out of the stump left behind. 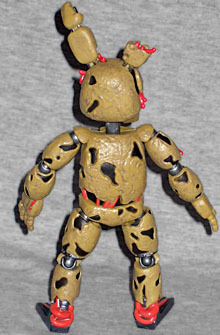 Springtrap's entire body is torn and tattered with gaping holes exposing caging and wires throughout, thus making Springtrap appear much more macabre-looking than any of the other animatronics from previous installments. While both hands and feet are attached and generally intact, his legs are entirely stripped from the mid-shin down, fully exposing endoskeleton metal and wiring. From his right hand, half of the middle finger is missing. He does not typically open his mouth - instead, Springtrap wears a permanent, wide grin as the material surrounding his teeth has deteriorated. Close examination of Springtrap and the rare boot images depicting him show that there appear to be human remains within the suit. When viewing the torso and other exposed sections of the endoskeleton, there are chunks of dark pink material that resemble human innards. In the boot images, Springtrap has his jaw open and is pulling the suit's head up, revealing a mummified-looking human head. Why the extra long bio? Because all that awesome description there really draws attention to the deficiencies of having a non-FNAF1 animatronic in this very softly-sculpted, minimalist line from Funko. See, the original FNAF animatronics were a lot simpler 3D models than those in later games, so Funko's softer sculpts made a fair amount of sense, even if they were a little disappointing. Adding a build-a-figure to the line was a terrific touch, making up for the lack of accessories and general lower quality of the figures. Problem is, Springtrap is such a scary, twisted-looking thing that this approach doesn't do the character justice. Springtrap snaps together from all the parts you've collected from your other FNAF figures, and stands the same height as Bonnie from the top of the one remaining bunny ear to the exposed animatronic feet. The sculpt here features the exposed parts but has nothing sculpted below them, just tears with the red sections revealed and prolapsed. 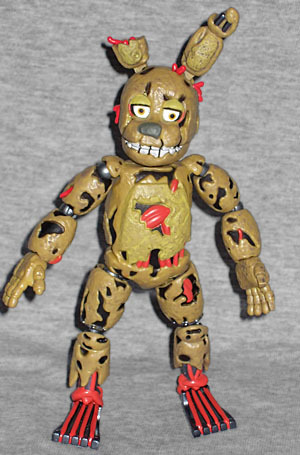 This is especially notable on his belly, which is so simplistic that it barely looks like it's busted up, the way Springtrap is supposed to be. It's is worth noting that Springtrap is missing half of his middle finger as he's supposed to be, a nice little detail to go with the busted rabbit ear. Paint doesn't really help; Springtrap has his correct drab olive skintone, but then only blacks and reds for the exposed sections, with some metal highlights on the animatronic lower half. It's keeping in line with the other figures, and wouldn't really have made sense to have been a lot more detailed than the others in the line, but it doesn't do the character justice. From a distance, Springtrap looks just fine, but up close, this doesn't cut it. Articulation is shared with his brethren: he's got plenty of balljoints, but they snap out of place easily, and isn't really that poseable. Again with the missing jaw articulation, which is a shame, but because of how messed-up this guy looks, he doesn't need it to look threatening, unlike the happy bears and bunnies that comprise the rest of the line. As a build-a-figure, he doesn't have any accessories, being that he is an accessory, and I'm not sure what he would have come with anyway. And so that's that, Funko's Five Nights at Freddy's. A somewhat disappointing but still cool toyline, that is apparently doing crazy business - these guys are hard to get now, to the point wherein I've had messages on eBay about the toys when I accidentally included them in photos of other items I'm selling. 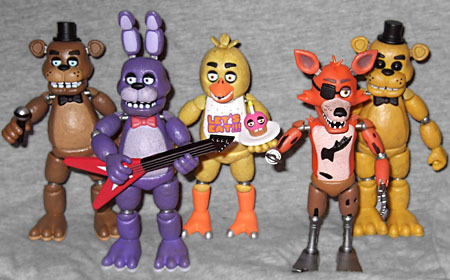 The phenomena that is Five Nights at Freddy's was bound to gather interest and attention, although I feel perhaps it deserved some better figures - with luck, it might get some in the future, and they might even compliment these toys instead of replacing them: I've love to see a line of animatronics than can be posed attacking, looking horrific, compared to the cutesy fun times these existing figures are. Why not have both, I say? The more the merrier!